Water touches the life of every person in Arizona and we are the go-to organization for information and engagement. Learn more about our leadership. Quickly find who you want to reach out to. Send us a note or simply drop by. Water issues affect the United States in important ways. The National Institutes for Water Resources (NIWR) plays a major role in addressing the unique water-related concerns of the individual states and the nation as a whole by providing a national platform for collaboration. A Water Resources Research Institute is located in each State, the District of Colombia, and the U.S. Territories of the U.S. Virgin Islands, Puerto Rico, and Guam, for a total of 54 institutes. The NIWR network represents the only authorized federal-state program focused on applied water resources research, education, training, and outreach. 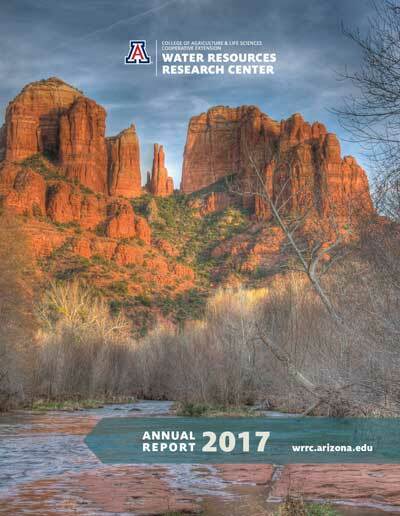 The WRRC is Arizona's water institute. 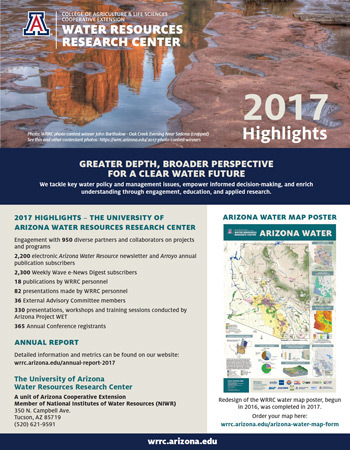 A 4-page summary and infographic presenting WRRC accomplishments in 2017. This is the WRRC response to Phase III of the College of Agriculture and Life Sciences Strategic Planning Process. This document explains our unit’s purpose, vision, mission and shared values, and details specific strategic goals that will enable the WRRC to realize its vision for 2021. It was made public on Friday, September 13, 2013. A document issued annually that summarizes selected WRRC research, programs, activities, and products. A research and extension unit of the College of Agriculture and Life Sciences, the WRRC is the designated state water resources research center established under the 1964 Federal Water Resources Research Act. The WRRC conducts water policy research and analysis, and its information transfer activities include publications, conferences, lectures, and seminars. Water news and information are provided to the academic community, water professionals, elected and appointed officials, students and the public. The WRRC is one of five University of Arizona water centers responsible for implementing the Water Sustainability Program, a component of the Water, Energy and Environmental Solutions (WEES), which receives funding from The University of Arizona’s Technology and Research Initiative Fund (TRIF). WRRC also is home to Arizona Project WET (Water Education for Teachers). Sta work collaboratively to deliver water information and education to multiple audiences across the state.